“Swee-ee-eet” call and twittering song. 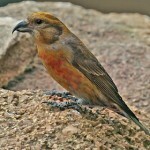 Description: Red or orange-red cap and black chin. Frostier and paler overall than Common Redpoll; slightly smaller bill. Light grayish-brown above with pale dusky streaking. Streaking on rump, flanks, and undertail coverts is minimal or absent. Breeding male has pink wash on breast, but color does not extend to cheeks or sides. Winter adults are paler overall. Habitat: Found in conifers, deciduous thickets, and weedy fields. Occasionally visits residential bird feeders. Often seen in company with Common Redpolls. Where in Nebraska: Accidental winter visitor. Seen in Lancaster, Custer, Scotts Bluff, and Sarpy Counties. 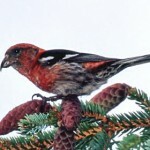 Hybrids with Common Redpolls can confuse identification. 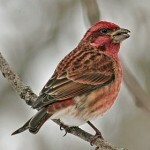 Field Notes: Hybridizes with Common Redpolls where ranges overlap. 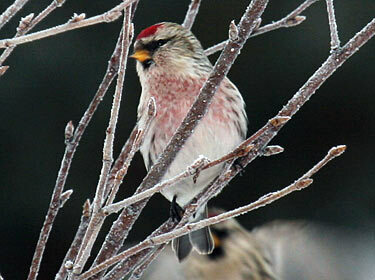 Fun Facts: Hoary Redpolls have very insulating feathers they use to keep warm in their artic climates. However, if the weather temporarily gets too warm they will pluck out some of their own feathers to cool down. The feathers grow back in few days so they will stay warm when cold weather returns.